The John M. & Marilyn Zeigler Student Achievement Award honors the past contributions to student needs of Dr. John Zeigler, the first SMS Associate Dean of Graduate Studies, and the continuing contributions of Mrs. Marilyn Zeigler. The Zeigler award formally recognizes students who excel in scholarship, leadership, research initiative, outstanding publications, and exceptional thesis or dissertation work. This year’s award recipient is Ms. Julia Moriarty. 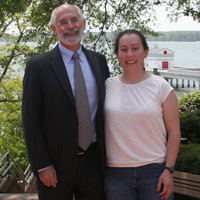 Julia first came to VIMS in 2008 as a student in the Research Experience for Undergraduates program. She returned for graduate school in 2009, and completed her Master’s in the Fall of 2012. For her thesis, Julia developed a three-dimensional computer model to predict sediment dispersal in coastal New Zealand. She participated in four New Zealand research cruises, where her easy-going personality and capable work quickly earned her a spot on the project’s “field team.” Julia added time to her New Zealand travel to seek expert advice on her model from local physical oceanographers. Julia has served as student representative for many VIMS governance committees, and has also contributed to VIMS through teaching assistantships for the graduate program and undergraduate minor. Away from work, Julia is an intrepid traveler who recently visited Israel and has driven cross-country with her sister. She values time with her family and friends, and visits her family near Washington, DC whenever possible. She is an avid runner, having completed a marathon since being at VIMS. Julia successfully competed for two fellowships for the upcoming summer, and has chosen to participate in the East Asia Pacific Studies Institute, an NSF program that funds US graduate students for fieldwork and collaborations in Asia. Julia will study rivers in Taiwan, seeking to better understand their role in delivering matter and nutrients to the coastal ocean. Julia is highly deserving of this year’s Zeigler Award, and we expect even more great things as she continues in the Ph.D. program.